Inti-Illimani Completes U.S. "Time Machine" Tour! 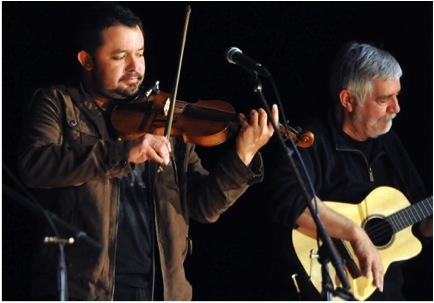 Over the last month, Inti-Illimani has crossed the country on their 45th Anniversary tour. The concerts featured songs from every era of the group's incredible history, taking spectators on a journey through time, culture, politics, and music. 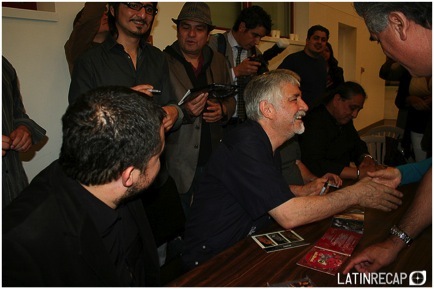 Inti-Illimani complimented their concerts with community outreach for students of all ages throughout the tour. Following are some photos and press excerpts....More press to come! For a band that has toured for 45 years, with original members and new ones, Inti-Illimani's sound is refreshing and modern. Each member contributes a great deal to the harmonizing sound that leaves each spectator longing to hear more. The eight members of the iconic Chilean group wowed the audience with their musicianship. They shared guitars, drums, panpipes, charangos, and bottles of water on stage, maintaining the same quality of feeling and sound on every song. Students listen to Inti-Illimani as they share their cultural legacy.